Get a brand new fully-assembled engine that’s virtually ready to run and delivers classic Edelbrock performance right out-of-the-box. Available in ten power levels, these engines include high-quality Edelbrock manifolds, carbs, cylinder heads, camshafts, and water pumps (optional). Edelbrock understands that every customer wants several different finishes to choose from. This is why Edelbrock offers our customers the option of having their crate engine coated in 3 different finishes. 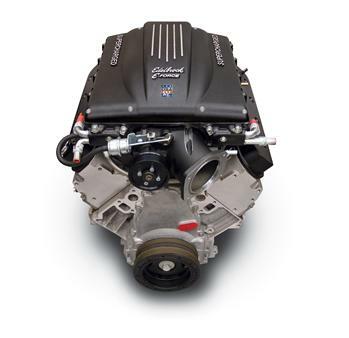 Edelbrock Crate Engines are Now Available in as Cast, Polished, and EnduraShine®. If you should order the “Polished Package” or the “EnduraShine®” package the following components will be treated… heads, intake manifold and water pump if applicable. When it came down to choosing the ideal distributor to fire our crate engines, the choice was easy. Some Edelbrock crate engines are equipped with MSD distributors, offering you one of the best ignition systems that money can buy. Whether it’s an MSD Pro-Billet Ready-to-Run and high-performance coil or the Pro-Billet HEI, these distributors are set-up with a special advance curve designed especially for Edelbrock Crate Engines. All Edelbrock crate engines come with a 24 month, unlimited mileage insured warranty. With this exclusive crate engine warranty, you get classic Edelbrock proven performance backed by a proven warranty for complete peace of mind. One of the great features of this warranty is your right to choose a service facility. Upon Edelbrock’s approval, you have the flexibility of choosing any ASE-certified facility nationwide to take care of your warranty claims. Whether you’re close to home or on a cross country cruise, we’ve got you covered. Important Note: To activate warranty service, the warranty card included with the engine must be completed and submitted to Edelbrock within thirty (30) days of purchase.